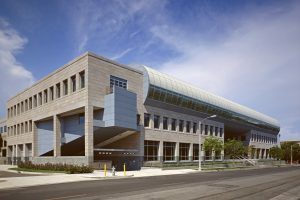 CMF fabricated and installed 12,000 square feet of zinc metal panels at wall and soffit areas. 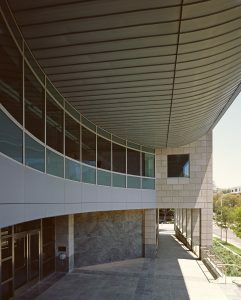 Areas clad in zinc included the conference tower, screen room, elevator core, and the standing seam radius soffit at the building entry. CMF also fabricated and installed perforated metal panels in the atrium and stainless steel paneling at the elevators. Preweathered .7mm Rheinzink panels at inverted radius entry soffit. Panels were aligned with window mullions and stone modules.